Michael Trese, MD, Royal Oak, Mich.
Now, with Dr. Gottlieb ensuring patients’ safety on one hand, and the approval of Luxturna (voretigene neparvovec-rzyl, Spark) and the existence of similar treatments in the pipeline on the other, patients may be entering an age where effective therapies are truly possible. In this article, I’ll provide a brief review of the challenges of regenerative medicine and how researchers may be able to solve them. To what extent is Dr. Gottlieb’s optimism regarding tissue regeneration warranted for retinal diseases? First, after many years of the lay press announcing that gene therapy was just around the corner, we now have an approved gene therapy for Leber’s congenital amaurosis in the form of Luxturna. Second, at the University of Southern California, stem cells are being introduced into the subretinal space in an effort to reactivate macular function.2 Laboratory-based, in vitro growth of retina cells, and indeed whole retina organ cultures, has been performed since at least 2012.3 The thought is that these lab-grown tissues can be transplanted into diseased eyes in order to replace damaged tissue. It may be that some organs/tissues are more amenable to regenerative therapies, particularly the heart and liver; a stem-cell cardiac study is already underway in Japan.4 The eye in general, and the retina in particular, present not only highly organized neuronal and vascular elements, but also complicated, highly connected structures that are necessary to produce vision. Restoring this complex organ to a complete functional level in various diseases will be a tall order, and is more challenging than getting patients to see the useful but limited visual percepts achieved with mechanical approaches such as retinal prostheses. Is it possible to regenerate a system as complicated as the eye? It’s likely possible, but doing so may require rethinking what constitutes regenerative medicine. 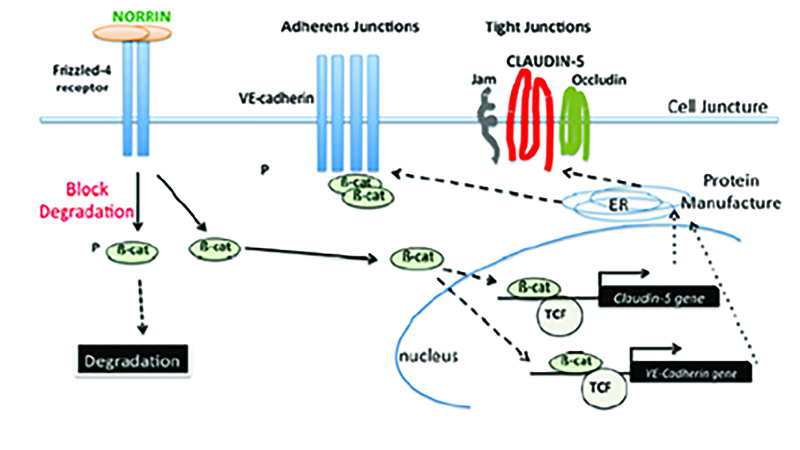 Norrin binding to the Frizzled-4 receptor, triggering the production of two of the myriad of proteins associated with Wnt signaling: VE cadherin and Claudin 5. Click here to enlarge. Introducing a primitive stem cell into a diseased adult eye might provide an environment or substrate that’s only able to slow degeneration. That may be a reasonable solution for diseases of older adults, but what about diseases that take the vision of the young? If we examine the development of the retina in fetal and infant life, we find that much is dictated by the growth environment provided by signaling systems. Though these systems are key to the eye’s development, most physicians aren’t used to thinking about them, especially as a therapeutic target. Signaling systems, however, such as Wnt, NOTCH and Hedgehog, are vitally important to fetal and infant development. They produce a large number of substances, mostly proteins, that support proper growth of cells to form complex, interconnected structures. Wnt signaling, for example, is driven by the protein Norrin, which binds to the surface of endothelial and epithelial cells to produce many proteins that form an organized vascular and neuronal structure in the retina. A congenital absence or underproduction of functional Norrin protein results in Norrie disease, which causes blindness in all children affected, as well as deafness and developmental delay in another large percentage of them. In many pediatric and adult retinal diseases, however, it may be possible to recreate this Norrin-driven Wnt signaling environment. Norrin-induced activation of the Wnt signaling system in adults may be able to effectively promote the growth of dormant autologous vascular and neuronal stem cells to regrow retinal capillaries and neurons in areas of capillary and neuronal loss by repairing these damaged cells. This would result in a reduction of VEGF-drive-restoring function, and avoid capillary loss and destructive laser therapy. It’s also worth noting that signaling systems vitally necessary in development may serve pathogenic roles as we age, with angiogenesis and cancer being just two examples. This is true for both the Wnt and Hedgehog signaling systems. For the Wnt signaling system, for example, pathologic angiogenesis is driven by Wnt proteins 3a, 7a, and 10a. Dr. Trese is a partner at Associated Retinal Consultants and chief of pediatric and adult retina at Oakland University William Beaumont School of Medicine in Auburn Hills, Michigan. His email address is mtrese@arcpc.net. He is also a co-founder of Retinal Solutions, which is developing a regenerative therapeutic. 2. Kashani A, Lebkowski JS, Rahhal FM, et al. A bioengineered RPE monolayer for advanced, dry AMD. Sci Transl Med 2018;10:435. 3. First mouse now human, lab grown eye tissue. https://phys.org/news/2012-11-mouse-human-lab-grown-eye-tissue.html. Accessed 7 September 2018. 4. ‘Reprogrammed” stem cells approved to mend human hearts for the first time. https://www.nature.com/articles/d41586-018-05278-8. Accessed 7 September 2018.